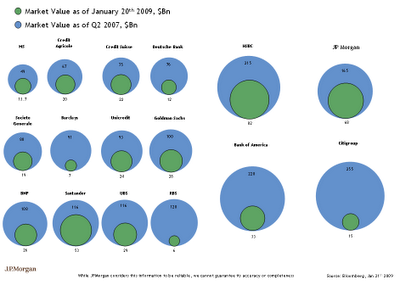 Inquiring minds are investigating a visual comparison of banks' market caps valuation as of January 20, 2009 vs. the second quarter of 2007. Note: I had posted a draft version of the chart that follows. Here is the corrected copy with thanks to Financial Times Alphaville. chart courtesy of JP Morgan and Bloomberg. The chart is an illustration of extreme leverage in reverse. Bear in mind that fallout from Alt-A, prime home equity, credit cards, small business, and commercial real estate are still on the way. The global banking system is clearly insolvent as discussed in Fed and BOE Shell Games to Bailout Insolvent Banks and British banks are 'technically insolvent' (and other secrecies). US banks levered cash to loans at 25:1 and liabilities at 33:1 at the credit bubble peak. The long term historic average ratios are about 5-7:1, and 7-10:1 respectively. Moreover, historically, the ratio of real estate loans to cash averaged 1.25 to 2 (!!!) on a sustained basis, whereas the ratio at the unprecedented hyper-leveraged point in 2007-2008 reached 12-13:1, with real estate loans as a share of all bank loans reaching almost 60%. Real estate loans/GDP topped out at 26-27% (!!!). Were the banks' cash ratio to "unreal" estate loans to return to the historically sustainable range, banks would either need to (1) triple and quadruple their cash assets from $1T to $3T-$4T and/or (2) write down real estate assets commensurately or a combination thereof. Wells Fargo is loaded to the rafters with eventually non-performing residential and commercial real estate loans in the US Pacific Northwest the last region of the country to enter the Kuznets Cycle bust to date. Consider what virtually no growth in real estate loans combined with a tripling or quadrupling of banks' cash assets means to the real estate market and US overall investment, consumption, government receipts, and payrolls going forward. The negative effects of bank liquidation and reverse leverage risk outright systemic collapse. In Brink of Debt Disaster we looked at how consumer debt has the United States and the United Kingdom stand on the brink of the largest debt crisis in history. Together, these posts show the threat of an outright global systemic deflationary crash is very real. This is not a call for a global crash, rather a warning that one could easily occur.